Creative Inkspirations: Stamping for You! This week started mild and Spring like, flowers were bursting out of the ground, birds were singing and the sun was warm. By the weeks end the cold had returned and had even left us with some icy stuff covering the ground and most everything else. 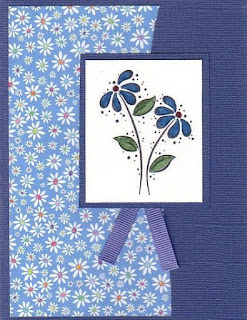 Cold always makes me think of the color blue so in honor of the cold I created this card using the new Daisy set and some of the printed paper from Frutti Fusion. Sort of speaks to Spring and the cold at the same time. Why not take a little time to create something that reflects how you are feeling today! Sometimes we spend so much time making things because we have to, that we forget about doing it just for fun and for ourselves! So find a quiet moment to sit a create just for you, whatever strikes your fancy! Till next time,Happy Stamping & Scrapping!